Every few years, the US Department of Energy collects energy data on various types of commercial buildings across the Country, including religious buildings. With the help of Mike MacDonald of Oak Ridge Labs, we have organized the data into three graphs. So, from these three graphs, we can estimate that the average building used for religious worship in the United States has about 7,000 square feet and uses 2 kilowatthours of electricity per square foot per year. Energy other than electricity includes natural gas, fuel oil and propane. The average religious worship building uses about 19,000 Btus per square foot each year. This is equivalent to about 0.18 CCF of gas or 0.14 gallons of fuel oil. 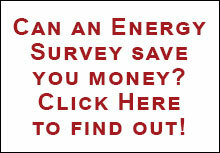 The average for all forms of energy per year is about 39,000 Btus per square foot per year.